A DPW rendering of option 1 for Potrero between 22nd and 24th Streets, which appeared to be most favored by attendees. Updated 11/14, 2:34 p.m. with response from Supervisor David Campos below. Design options for the embattled plan to improve safety Potrero Avenue have come down to the two blocks between 22nd and 24th Streets in front of SF General Hospital. According to a vote via stickers placed on a board, most attendees at a public meeting last week seemed to favor Option 1, with a landscaped median and widened sidewalk — not the preservation of car parking that project opponents want. Option 1 would retain the most important expansion of pedestrian space, but it’s still half the size of the four-block sidewalk expansion the city originally sought before the parking-obsessed opponents exerted their will. The rest of the project area, which covers Potrero between 17th and 25th Streets, is now set to receive a landscaped median and buffered bike lanes, a longer transit lane than the one that exists (moved from the northbound side to southbound), and no sidewalk expansions, instead retaining parking and traffic lanes for cars. For the blocks between 22nd and 24th, city planners have left it up to the public to vote for one of three choices: Options 1, 2, and 3. 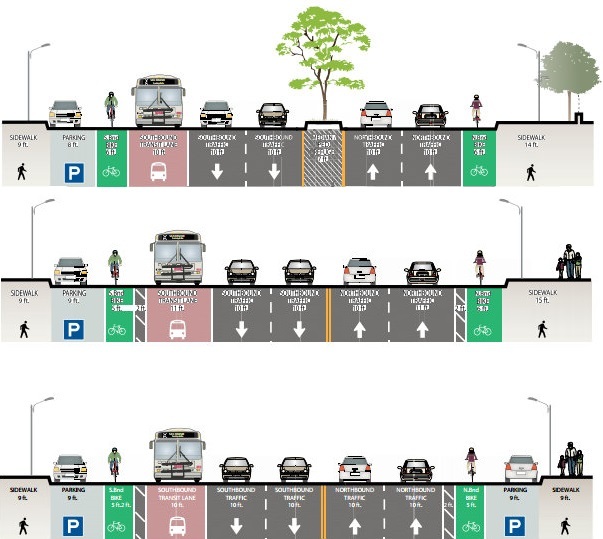 Options 1 and 2 would both include a wider east sidewalk, with a fraction of the road space allocated to either a planted center median (Option 1) or a two-foot buffer for the bike lanes (Option 2). Option 3 would forego sidewalk widening to preserve 26 car parking spaces and include a bike lane buffer, but no planted median. Another meeting on the project will be held on November 21 where the public can weigh in. City planners have solidified the plan for the rest of Potrero between 17th and 25th. It calls for the landscaped center median, two-foot bike lane buffers, and a colored transit-only lane southbound from 18th to 24th Streets. Aside from some expansions at street corners and bus stops, sidewalk widenings on those blocks are now off the table to preserve car parking. Originally, Potrero’s eastern sidewalk was in line for a four-block widening instead of two blocks. “We were willing to make the trade-offs because we still got widening in strategic locations where we needed it the most,” said Cristina Calderón Olea, project manager for the Department of Public Works. “This bus stop is always overflowing,” she said, pointing to an illustration of the plan for a bus bulb on the west side of Potrero at 24th, which would only require the removal of one parking space. Nearly every corner along this stretch of Potrero would get a bulb-out under any option, except where the curb space is needed for bus stops. At T-intersections, most sidewalks at the top of the “T” would be extended from crosswalk to crosswalk (see above). Between 26 and 52 parking spaces on Potrero would be removed for the safety improvements, depending on the design option chosen. 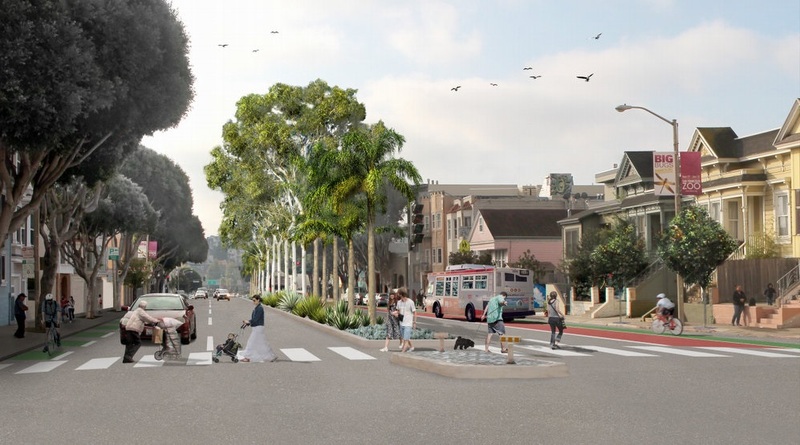 But that count doesn’t include the addition of 10 to 20 spaces that could be added on parallel blocks of San Bruno Avenue and Utah Streets, according to planners. The SFMTA and DPW had originally proposed safety upgrades that would require the removal of as many as 100 parking spaces, but back-pedaled after opposition from neighboring residents and merchants. Supervisors David Campos and Malia Cohen, whose districts share a border along Potrero, have not publicly taken a stance on the project’s design options. However, both have recently criticized development projects they think don’t include enough private car parking, as well as the SFMTA’s efforts to manage parking demand by installing meters. The improvements to Potrero Avenue is a large project with lots of considerations to account for. In San Francisco we are proud to have a robust community process but it is my job as Supervisor to ensure that our citizens safety is the top concern. So of course pedestrian and bicyclists safety is absolutely a priority. I want to be sure that we make responsible improvements to Potrero so we do not have any more tragedies like we did on October 26th [when Hang Chen Li was killed by a driver at 16th and Potrero]. As a city we want to make sure our streets are safe for people who drive, walk, and ride them. To do this all residents need to be involved. This is why I asked DPW and SFMTA to hold additional community meetings so that all affected residents have an opportunity to understand the improvements and all of the concerns involved. Campos’ office did not respond to the same request for comment. At the end of the day, I want to support an outcome that’s going to ensure the safety of everyone, including pedestrians and bicyclists. I do support the widening of the sidewalks — I think from an ADA perspective, it makes a lot of sense. I want an outcome that will maximize public safety. I think that was has been proposed strikes that balance. I appreciate the way they’ve approached it. I don’t know that anything is perfect, but I think it’s a balanced approach that takes into account the various concerns. I think there has to be give and take all around, and that we’ve had so many pedestrian and bicycle casualties that it’s make sure the streets are safe, and also take into account the needs of drivers, and I think that’s been done here. Cuttler, the nurse, said he’s been organizing for a safer Potrero since 2003, when four-year-old Elizabeth Dominguez was killed by a city truck driver who ran a red light, hit a car, and jumped the curb at Potrero and 24th. Another open house community meeting on the Potrero project will be held on November 21 at the Brava Theater, 2781 24th Street, from 6 to 8 p.m. See the full design illustrations at the DPW website. I can see why meeting participants might like option 1: the planted, raised median provides a vital safety and rest area in the middle for elderly and other people who can’t make it quickly across five lanes for motorized vehicles and 2 bike lanes. With such a wide street, the planted median might signal to drivers that this neighborhood counts, that they should show a bit of respect to pedestrians and bikers. I know others hate the medians for allowing speeding. But couldn’t that speed problem be better solved by timing the lights to turn green at 20 or 25 mph, so that few experienced travelers bother gunning it between lights? Also, could Option 1 stick some soft hit poles along the bike lane northbound, so that it does not become a de-facto stopped car lane? The other two options are better for biking, but I usually take the parallel, quieter street Hampshire, so I feel there are some viable options for bikers even with Option 1. Other opinions? A planted median does in fact signal to drivers that they should slow down, if the plantings are done correctly. It does this with subconscious clues – large trees planted close to the roadway reduce sight distances which makes drivers want to slow down since they can’t easily see what is ahead of them. In addition, the blur of all those tree trunks whooshing by gives a feeling of speed. When objects are closer to you, you feel like you are going faster. This is why go-karts feel fast at 25 mph, or why a plane ride at the same speed is more exciting lower to the ground than higher up. One of the engineers was talking about this effect at the meeting. It is good they are using all their weapons, even the subconscious, to try to slow people down. Maybe a Potrero with slower traffic is better than having two extra feet between you and the cars. If trees planted close to the roadway slow down drivers, why not place them on the edges of the streets rather than down the middle? Then you have the additional benefit of providing shade for people walking on the sidewalk which protects them from the roadway. Putting them in the middle of the road provides a subtle cue that the roadway is what’s important, not the space around it. This positioning of trees on the edges rather than in the middle forces drivers in the left lanes of traffic to be more aware of what’s coming at them. When you’re in the left lane seeing traffic coming at you with only a few feet of separation you are forced to drive with a greater level of awareness. Putting a median in the middle despite the addition of trees provides a cue that while in the left lane you can drive faster because you don’t see any traffic coming at you from that direction. Unfortunately the tendency in this city is to overprune trees, at times removing the entire lower canopy and its branches. This practice is called lion’s-tailing and is actually illegal in San Francisco. The illustration shows it in practice with the Indian Laurel FIg street trees at the left, but in reality those trees are trimmed back even worse. The new trees depicted in the median appear to be species with no lower canopy at all (Mexican Fan Palms and Lemon-Scented Gums?). The trees in the median and along the “pedestrian domain” on Octavia Boulevard are well-chosen species, but the DPW reliably overprunes those, as well. Presumably to save money, they rip out the entire lower canopy, removing all traffic-calming benefit and drastically reducing the tree’s life. And, of course, at the intersection with Market we’re back to the palm trees and the sightlines are wide open, and people drive accordingly. I agree, street trees along the sidewalk instead of in a median have many benefits. But the practice of turning them into Truffula tufts needs to stop. Calderón Olea, project manager for the Department of Public Works. “We still got” is something that someone begging for scraps says. How is it tht that the project manager for the DPW is begging for scraps instead of getting what they want? “Where we needed it the most”. But other places where it was needed, but not “needed the most”, we couldn’t pull it off. They aren’t standing on plants. The median provides a buffer for cars from worrying about getting hit head on, so they can go faster. Pedestrian refuges only need to exist in the crosswalks. I invite you to visit Valencia Street. The lights have been timed at 13 MPH for years. Every day I enter Valencia Street and wait at the first red next to some car. And at every light, the driver would gun the engine and race to the next light, while we would look at our speedos and settle in at 13 MPH. And say hi to the driver at every light as they got more and more frustrated. This scene would repeat EVERY day. I am fairly certain there are hundreds of drivers who still can’t figure out why they can’t beat the cyclists down Valencia, probably thinking that the light timing is random and they just keep getting unlucky. Even the most aggro fixie rider has figured out the light timing. Olea is the project manager for 2nd street as well. In my experience she’s been really great and cares about making these streets better, but I’m surprised to hear she works on two huge projects. I have a feeling the combination of her bosses and angry public might be wearing her down to these sad compromises. I’m anxious to hear about what’s going to happen to 2nd street as well, they didn’t publicize their final decision going into the environmental review. I ended up putting my “vote” on Option B (wider sidewalks & buffered lanes). I live a few blocks away on the Potrero Hill side, and ride on Potrero Ave for a couple of blocks taking my kid to swimming lessons, so an extra 2 feet of separation from cars will be welcome. I’m not a big fan of medians. Based on biking on San Jose and walking on Divisidaro, they seem to make cars go faster – I feel like they remove the threat of a head-on collision, so make drivers less cautious. I think even the plan without the medians still has the same size pedestrian refuges at the intersections (but really, who wants to be a refugee? Just lengthen the crossing time!). The other problem with adding a median now is that I don’t want to lock us into this particular street plan. I feel like in 5-10 years we’ll be making better decisions & could have center-running BRT on Potrero with boarding islands, protected bike lanes, and that might need a different layout for the center of the street. 13 mph is a green wave and meant for cyclists to be able to bike steadily without the temptation of running red lights that are occurring otherwise every other block. They are not meant to create an easy, safe speed flow for motorized traffic. It would be great if signs were posted for motorists showing them the 13 mph light timing. I think a lot of drivers would choose an alternate, parallel route. I certainly made that change when driving and not riding, once I read on this blog what the Valencia timing was. A better example would be Pine Street with its timed lights. They still need signs to notify drivers, but at least the regulars know there is little point in driving faster than 25-30 mph. Traffic flows and is safer for it, though of course it is not safe for cyclists, due to its size and layout (five lanes of moving or parked cars). Gough and Franklin are the canonical timed streets. Any timed lights help ALL traffic flow better. Yes, even cars at 13 mph. One transit-only lane? So the southbound bus moves fast but the northbound bus is stuck in traffic? A second transit lane is not being added, but I edited the article to note that the proposed southbound transit lane would be longer than the existing northbound one that it will replace. Ok. I will look for those signs. And Mike, timed lights don’t make all traffic flow better, just the traffic they are designed for. Otherwise, wouldn’t Valencia drivers be better behaved, and wouldn’t more cyclists stop at more lights elsewhere, if things were actually designed with cyclists in mind? Mismatched infrastructure contributes a lot to law breaking. We see that often with bikers shunted about and trying to effect a decent commute while lights, pavement, markings, space and everything else ignore cyclist needs, safety, etc. The happy fun google machine will do it for you. Not true. In an urban area with heavier traffic, lights that are “random” result in traffic backing up based on the lights, such that vehicles will end up spending multiple cycles at the same light. Yes, a hundred up-votes! And also, a transit stop makes for a far better pedestrian refuge than a high-curb median anyway. If you take refuge in the middle of Dolores, for example, it’s awkward to step way up to the grassy median (and you might find yourself stepping on dog doo as well). If you stand in the road, though, at night you could possibly get creamed by some careless u-turner. That’s hardly a safe ‘refuge.’ And I’ll invite anyone to come watch 90% of drivers speeding over here any day. This myth of the median having pedestrian benefits has got to be squashed, once and for all. She’s also working on the Geary and Polk Streetscape projects. Look at Murph’s link about Valencia. Really not a fan of the medians. As others have noted it just makes the street feel more highway-like. Wow, That (the SFMTA study) is really cool, Mike. Thank you for the link. Do you know if they did a post implementation study to see if projections were indeed made real? Maybe that would have cost too much, so I am not saying it is absolutely necessary. My purely anecdotal experience of Valencia is that it does not work great when we are in the car, but I like it to bike on. Perhaps it never worked great in commute hours, but that’s not when I am generally on it. We usually drive via Guerrero or Dolores now. Thanks, now I see a picture of a sign I never noticed. Weird, because I’ve biked and driven Valencia at least two dozen times in the last couple of years. Yes, if anything, I got a design education from Valencia’s failures to keep double parking and drop -offs from significantly impeding cyclists. Made me a real fan of buffered or protected bike lanes next to the curb and parked cars to the left of said bike lanes. She must have a high tolerance for merchant and resident misinformation and hysteria. It isn’t something you would look for so probably easy to miss. I’ll agree with that, trees on the sides are better than trees in the median. Three things though. Potrero is 82′ from curb to curb right now (or 77′ with a sidewalk widening) which is far greater than what is optimum for the effect of the trees. Second, there are huge existing trees that are unfortunately at the BACK of the sidewalk and removal would be expensive and difficult. Would people support millions of dollars to move trees 12 feet? Third, it seems the goal is pedestrian improvements for hospital goers who have difficulty crossing the street all the way (even Option 3 gives 6 foot refuges at intersections), so if they are already adding median refuges, why not plant the median and try to get people to slow down a bit? More space on the roadways (including buffers) give the illusion that it safe to drive fast. Better road design should include as many elements as possible that slow down cars. I see how planted medians slow cars down. I don’t see that buffers do. In the end if a driver loses control, the extra two feet is not going to do much (the collision happens .01 sec later), but if the car is driving 10 mph less, that is the difference between life and death in a cycle – car collision. Never knew that to be honest. Thanks for the heads up. I also noticed at the 2nd St. meeting her distinct lack of “relish” to take on the overly emotional though highly irrational arguments of the motorists. The numbers are on her side, but for some reason she doesn’t use them to the greatest effect. Never goes in for the kill, at least not in public. Is this stuff “wearing her down?” I suppose it is, but then again any less committed person would have jumped off the new Eastern Span of the Bay Bridge by now. Hell, if I were a planner facing these people day after day, night after night, I would have jumped off the _old_ Eastern Span by this point. Thanks for that link. It allows one to view the abstract, but not the full report.